Does John play with Dylan? 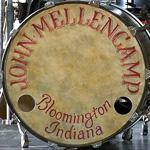 John Mellencamp Community > MELLENCAMP.COM ANNOUNCEMENTS > Ticket & Tour Questions > Does John play with Dylan? Does John play with Dylan at all? Does John go on before or after Dylan? Re: Does John play with Dylan? John plays in the slot before Bob Dylan. The time varies but John plays in the daylight and Dylan goes in just as it gets dark typically depending on time zone. John will play approximately 65 minutes and Dylan will play closer to 90 minutes. On the 2009 tour John and Bob did not join each other on stage.